Happiness is Pure Badger! 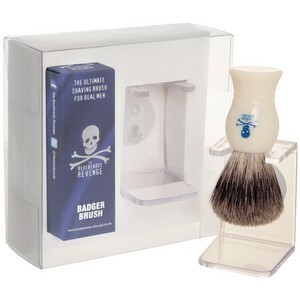 This fabulous shaving brush is designed to create the best lather and to thoroughly lift each hair and coat it with The Bluebeards Revenge Shaving Cream. Believe us when we say that using this brush with the shaving cream will elevate the quality of your shave from a day-to-day drudgery to a not-to-be-missed event. Each brush is stamped with our distinctive logo and will look just so parked in your bathroom on the accompanying drip stand.